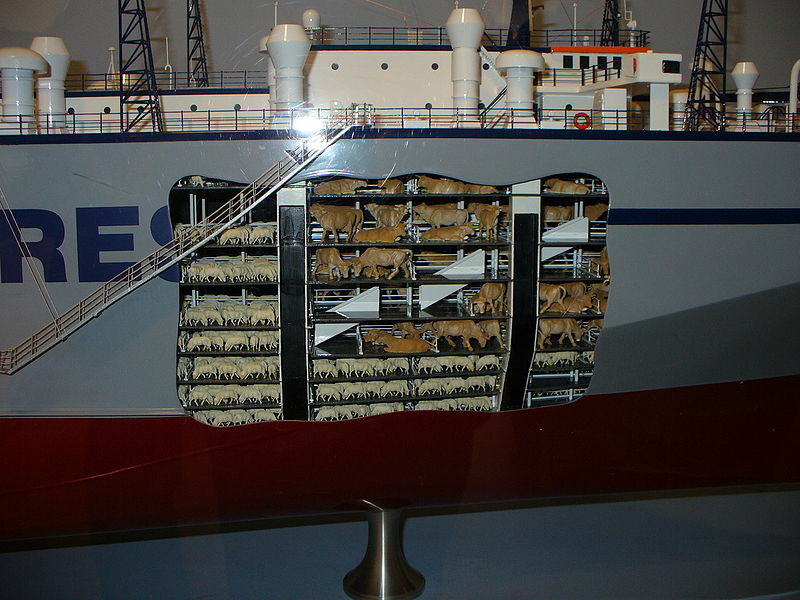 Seagoing vessels modified or purpose-hansing carry built for the transportation of live animals. Subject to appropriate regulation, live animals may be transported as part of the cargo on various classes of ship. That particular method of transportation is more common on short sea crossings (e.g. ferries) and usually involves relatively small numbers of animals. 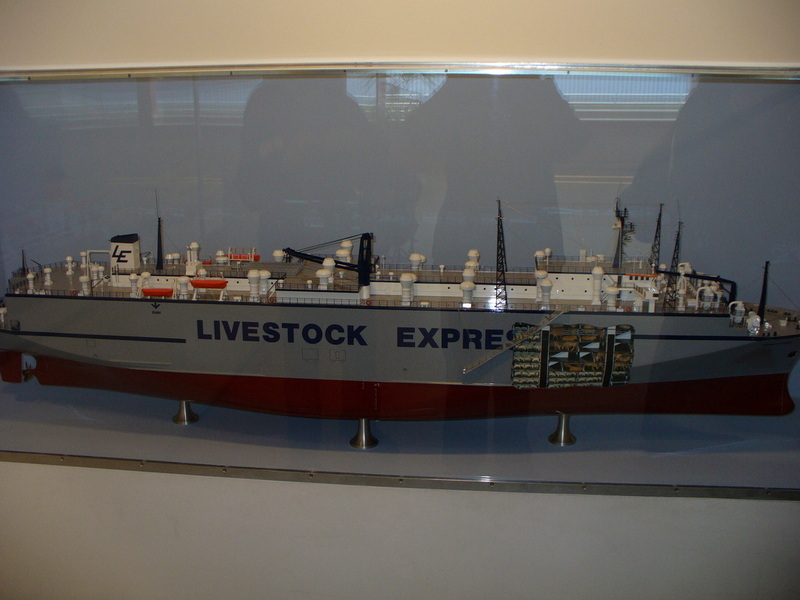 Livestock carriers are those ships, which specialise exclusively in the transportation of large numbers of live animals together with their requirements for the voyage. (food, water, sawdust bedding, medication, etc.). Voyages on livestock carriers generally last from three days to three to four weeks. Open livestock carriers - in which all, or most, of the animal pens are installed on open decks. In theory, this provides continuous natural ventilation of the pen areas and avoids reliance on mechanical ventilation systems. (Ventilation is a key factor in the transport of live animals. When animal pens become poorly ventilated, oxygen depletion and a build-up of toxic gases, develops very rapidly. Circumstances vary according to ambient conditions but a failure of ventilation systems in some tropical conditions could result in extensive asphyxiation of animals, in as little as two or three hours). In practice, natural ventilation alone isn't adequate for all situations. One obvious limiting factor would be in following wind conditions at sea, when the air moves at the same speed as the ship. In that condition, the natural air flow ventilating the animal pens could be insufficient. On most open livestock carriers, there is also some type of supplementary mechanical ventilation installed in critical zones, along with appropriate back-up equipment for emergencies. Closed livestock carriers - in which more or less all of the animals pens are located within the holds and internal decks of the ship. This has the advantage of providing a more controlled environment in which the animals and their feeding and watering arrangements are sheltered from adverse weather. However, ventilation is almost entirely dependent on mechanical systems on 'closed' livestock carriers and construction rules require specific ventilation standards for the internal spaces. These usually stipulate the minimum number of air changes per hour. Regulations also require back-up systems and auxiliary power arrangements on those ships which are separate from the main engine room. This is to ensure that adequate ventilation, lighting, watering and feeding can be maintained, for the animals, in the event of fire or machinery failure in the main engine spaces. ﻿Various species have been transported in this way, but by far the most numerous are the domesticated breeds of sheep and cattle. 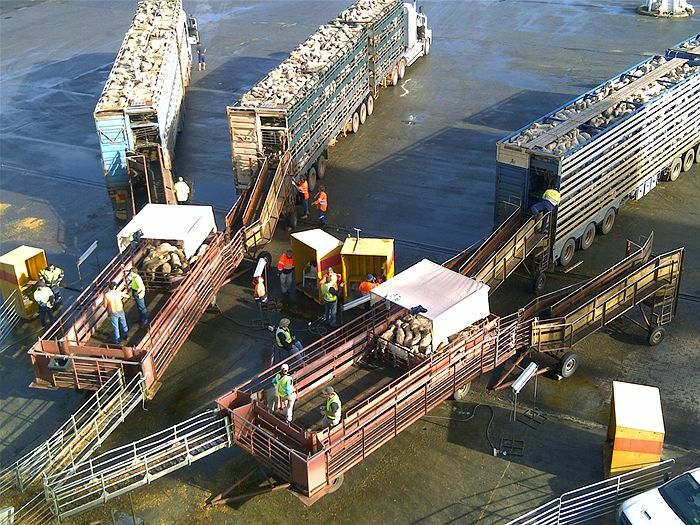 During the latter half of the twentieth century, millions of sheep and many thousands of cattle were transported on livestock carriers. Other domesticated species which have been transported, though in smaller numbers, include horses, camels, deer, goats and, on at least one occasion, ostriches. The transportation of live fish, on small specialised vessels, is a similar trade which has developed in association with fish farming National authorities which permit the export or import of live animals, regulate and monitor the ships and the associated aspects of the trade very closely. 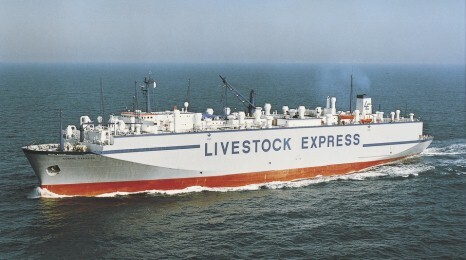 Sizes and capacities of livestock carriers The size of this type of ship varies, according to market demands in different parts of the world at different times. In the latter half of the twentieth century, the principal livestock exporting nations were Australia and New Zealand and the main importers were nations in the Middle East. Vessels engaged in that trade have ranged in size from 2,000 tonnes deadweight (DWT) to 25,000 DWT. The limiting factors on ship size are complex. Bigger vessels can achieve economies of scale in their operations but also require more extensive port facilities to handle the larger numbers of livestock likely to be loaded or discharged. 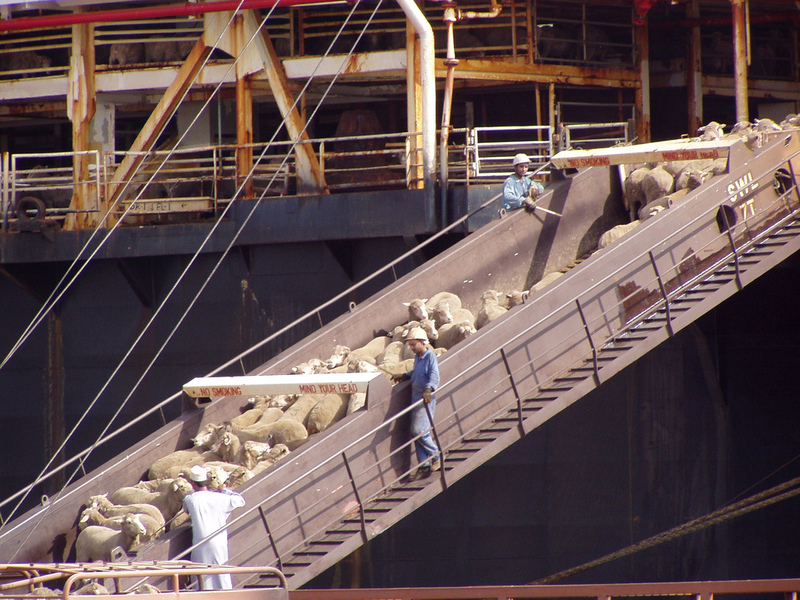 Livestock carriers carry more crew members than conventional cargo ships of a similar size. Experienced stockmen are an essential part of the crew. The total number of stockmen required varies according to the number of animals and also depends on factors such as the arrangement of the livestock pens and the extent of automated systems installed for feeding and watering. During the last three decades of the twentieth century there was a progressive trend towards large vessels carrying greater numbers of animals. Prior to that, a significant limitation had been fresh water storage capacity on ships. To maintain condition, average sized cattle require at least forty litres of water per head - per day. 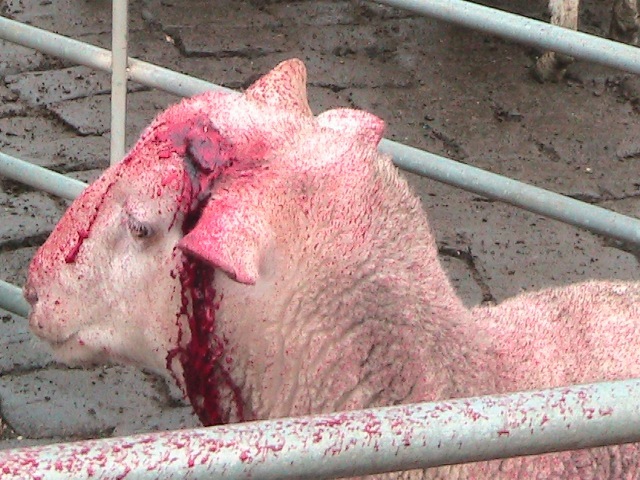 Sheep require at least four litres per head - per day. Developments in water production technology (salt water evaporators or reverse-osmosis systems) eventually led to livestock carriers with equipment capable of producing up to 600 tonnes of fresh water per day. Sheep and cattle also require fodder amounting to at least 2% of their body weight per day. Livestock carriers are required to carry sufficient feedstuffs for the maximum length of the voyage plus adequate reserves for emergencies. 'Medium' sized vessels with capacity for about 30,000 to 40,000 sheep - (or 3000 to 4000 head of cattle) - are a common size for this type of ship. However, during the last two decades of the twentieth century there were a small number of sheep carriers which had capacity for 130,000 sheep. There were at least two other large livestock carriers which specialised in combined cargoes of cattle and sheep. One had capacity for about 7,000 cattle plus 70,000 sheep and the other could carry 14,000 cattle plus 20,000 sheep. 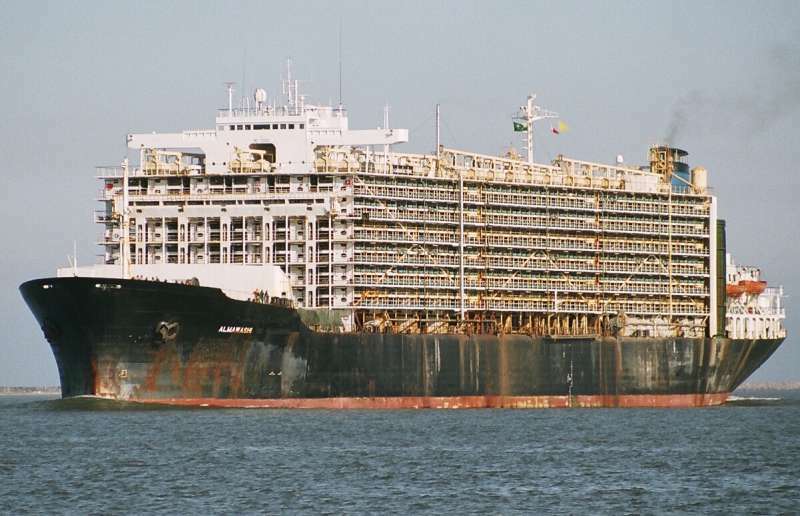 In 2007 the livestock carrier "Deneb Prima" was loading cargoes amounting to 20,000 cattle plus 2000 sheep. The numbers detailed above are only general indications. 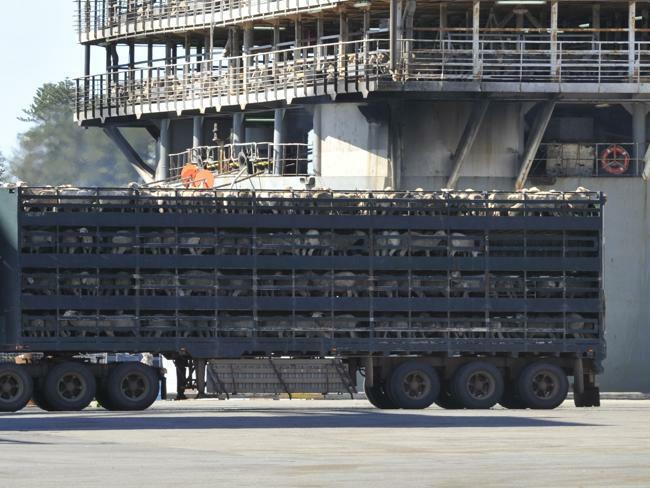 The space allocated to animals on livestock carriers is officially regulated according to their size and weight ranges. Larger and heavier animals are allocated proportionately more space per head. There are varying cultural attitudes throughout the world with regard to the broad subject of animal husbandry. The philosophical and ethical arguments involved are beyond the scope of this article but it is nevertheless a fact that the transportation of large numbers of animals on livestock carriers has been a matter of public and political controversy at times. In general, farming interests favour the export of live animals because it increases their marketing options. Businesses which have vested interests in exporting processed and refrigerated meats are against the export of live animals, for obvious reasons. The various issues are vigorously contended and facts are occasionally misrepresented to promote particular viewpoints. Allegations that the sea transport of live animals must be inherently cruel is not evident from trade data or official statistics. It is an unavoidable fact that mistreated animals deteriorate rapidly. That natural characteristic of all domesticated animals compels the crews on livestock carrier to ensure that good conditions are maintained during the voyages for it is also a fact that the importers of livestock are notably uncompromising individuals. 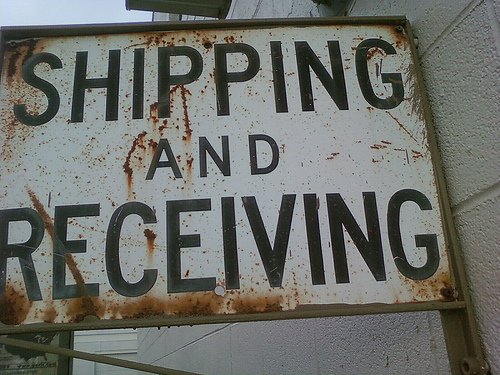 They will only accept animals which are delivered in good condition.